Fundamental note values – quarter, half, dotted half, whole notes and rests – are introduced and reinforced with clever word combinations and practice pages. Students clap, tap and point to rhythms away from the piano during "Rug Time." Large notation is easy to read, and fun pictures correspond to concepts presented. Children count beats in the first unit. Recordings are included to help parents practice with their children at home. Counting Made FUN goes with Note Reading Made FUN, Book 1. Note names are taught with corresponding animal names, designed to make learning notes more fun and memorable. In each song, students sing about where the note sits on the staff. Notes Made FUN also goes with Note Reading Made FUN, Book 1. Designed to build a solid foundation of early musical concepts and piano topography, students play and read music at a pace that is steady and comfortable. Using unique "keyboard pictures" that are easy to read, along with themed units, and play-along recordings – all making the process fun! 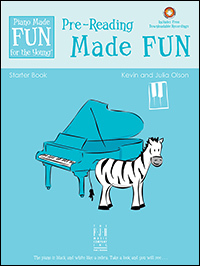 This Sing-Along Activity Book introduces basic music symbols with short, easy songs. "Folk-style" tunes help students remember each term, and recordings make it easy to sing at home or in the car - a great review for consistent reinforcement. 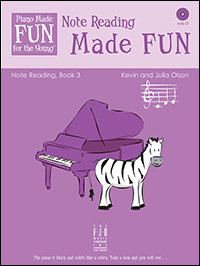 Theory Made FUN is used with Pre-Reading Made FUN, Starter Book and Note Reading Made FUN, Book 1. This book teaches and reinforces notes in the Middle C position on the staff. New notes are introduced at a steady and comfortable pace using an animal theme, and then are frequently reviewed throughout the book. Each unit shows which pages to use in the Sing-Along Activity Books for easy correlation. Notes in the C Position and Treble C Position are taught in this book. Some highlights are: new notes are gradually introduced; simple music that is easy to read; themed units and play-along recordings make learning fun and interesting; advice for parents regarding practice; blank manuscript paper for kids to practice writing notes or compose their own music. Recordings included. Book 3 continues teaching and reinforcing note reading with short, simple pieces using a systematic, sequential approach. Notes in the G positions, F position, and D position are introduced. Each unit uses an animal theme–such as giraffes, cows, and ducks–to correlate with the new note introduced. The lyrics are fun and informative!